The Pear’s audiences have been treated to a number of plays by George Bernard Shaw over the years, so it isn’t at all surprising that this season features Pygmalion coinciding with the 100th anniversary of the play. Many theatergoers are familiar with the popularized versions of the story from the stage and movie musicals entitled My Fair Lady. The musicals don’t quite capture the wit, bite, and unconventional nature of Shaw’s original play, as they are closer to classical romances with a love interest at the core. Pygmalion isn’t a love story. 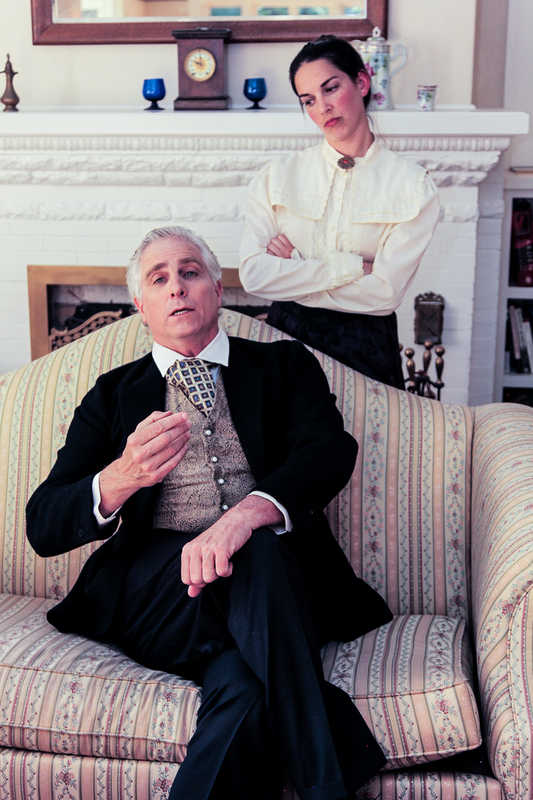 It’s a romance of provocative discovery, and The Pear’s production embraces the delicious display of Shaw’s views on the English class system. Intrigued, Pickering accepts the terms, but being a true gentleman, he also looks out for Eliza. Higgins’ housekeeper Mrs. Pearce (Leslie Newport) tries to keep order in the house, but between Higgins’ outbursts and his other bad behavior, it’s a very challenging job. Mrs. Higgins (Jackie O’Keefe) is somewhat embarrassed by her wayward son, but she befriends Eliza. Eliza’s father Alfred P. Doolittle (Todd Wright) touches Higgins for a nominal sum, and impresses him. On a lark, Higgins submits Doolittle’s name to an unlikely benefactor which spawns interesting and unexpected consequences for Doolittle. Rounding out the ensemble are Mrs. Higgins’ parlor maid (Helena G. Clarkson), Mrs. Eynsford Hill (Ann Kuchins) and her children Clara Eynsford Hill (Caroline Clark), and Freddy Eynsford Hill (Daniel Hurst). The Eynsford Hills are somewhat poverty stricken members of genteel society. Mrs. Eynsford Hill is well bred, Clara is a bit haughty, and Freddy is polite and is instantly infatuated with Eliza. The entire cast captures the dialect subtleties well thanks to British Guru Richard Newton. Although there are a few words here and there that stand out against the specific dialects they attempt to maintain, their overall consistency makes the piece work well. Johnson’s Pickering is very polished and genteel. He contrasts nicely with Renati’s Higgins. Renati captures the appropriate pomposity and brutishness that define Higgins. In the musical adaptations, Higgins is more the charming, but ill-mannered expert. In Pygmalion, Higgins is still a noted phonetics academic, but he’s less charming and more of a non-violent misogynist. Renati plays him stiffly and as more of a misanthrope. Even so, Higgins is a sympathetic character who is a bit too impressed by his previous successes. Krueger makes her Pear debut as Eliza. She appears comfortable in her character’s skin, mastering the uncultured flower girl, and transforming very believably into the Lady Higgins creates. Her diction is spot on for both extremes. O’Keefe too is very believable and she works well with both Renati and Krueger. Her expressions are wonderful, particularly when she’s displaying the exasperation Mrs. Higgins must feel when dealing with her son. Wright steals the show. Although he only has two scenes, he plays an extremely charismatic and sympathetic character in Doolittle. His energy and delivery are engaging, and he keeps Renati and Johnson on their toes, bounding at them with enthusiasm. Ron Gasparinetti’s set is a bit bigger than the venue needs this time. The set is lovely and captures the period very well, but it takes a lot of real estate decreasing the usable space significantly on the small Pear stage. His creative flat design allows for folding the walls over to switch inside locations. The furniture movement, on the other hand, takes significantly more time and effort. Michael Champlin’s direction includes some nice choreography for the set changes moving from the opening street scene to several transitions between Higgins’ study and Mrs. Higgins’ drawing room. Caroline Clark’s sound design includes period-appropriate music to accompany the set changes, making them into dances. One nice touch is a bit of instrumental music from My Fair Lady playing over the sound system during intermission. This is a solid production that captures the humor, commentary, and punch of the play very nicely, and the folks at The Pear are willing, wanting, and waiting for you to come see it. Please don’t disappoint them. When: Continues through 13 July 2014, Thursdays-Saturdays at 8PM, Sundays at 2PM. What a lovely, well-rounded review. Thank you for your time, talents, and insights!